Having earned the distinction of being the National Fruit of India (sorry, jackfruit and lychee -- I know you really tried), mangoes are found in a variety of Indian dishes in both their ripe and unripe form, being the key ingredient in everything from sour chutneys to savory curries to, most importantly, fresh sweet desserts. One of my earliest memories of mangoes isn't of actually eating one, it's of getting stopped at Atlanta-Hartsfield Jackson International Airport and being interrogated about them. The agent started badgering me with questions, and all the while I'm fiddling with the lock and racking my brain to remember the combination. "Did you bring anything back with you that you need to declare?" "No" Is it the numbers of my birth day? "Did you bring back any live plants?" "No" If it's my birthday, would it be the date or the year? "Did you bring back any fruit?" "No" 7-7, I think it had a 7. "You're sure you didn't bring back any mangoes -- India is known for its mangoes." "Yes, I'm sure." Oh my god, why can't I remember the combination. "A lot of people bring back mangoes, you know." "I don't have any mangoes." That's it. I will never get home. "I need you to tell me if you brought back any mangoes." "I DON'T LIKE MANGOES! WHY WOULD I BRING ONE BACK WITH ME WHEN I DON'T EVEN LIKE THEM?!" The stunned agent looked me in the face, appeared to be in shock at my outburst (probably not much as I am, remembering it), and told me I was cleared to leave the airport. Flash-forward 10 years later, and I guess I would have had a little more trouble with that customs agent today because I finally DO like mangoes. I can't really explain why I didn't like them as a teenager or through much of my 20s, though I think it may have been due to a lack of exposure. My parents, who were born and raised in India, ate mangoes on occasion but rarely ever offered them to us kids. Maybe they thought the fruit was too exotic? 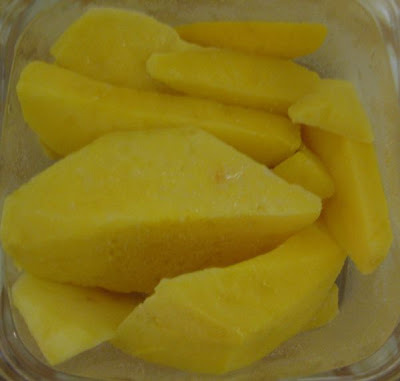 In my experience, it can also be hard to find good mangoes in regular grocery stores. The few times I've tried to buy the whole fruit, I usually wind up cutting into an unripe one -- which is fine is you're making a chutney but not so fine when you just want to enjoy a few juicy unadorned bites. These days, I typically get my fix with the already-diced kind, either fresh or frozen. (Trader Joe's has great Mango Chunks available in its freezer section.) Nick and I both love them. How to Prepare: Make sure you have a ripe mango by gently pushing its flesh. If it has a little give (similar to a ripe avocado), you should be good to go. Ripe mangoes also tend to be more naturally fragrant than unripe ones. As you're cutting it, keep in mind that there's a central pit that needs to be discarded. Rachel Rappaport at recipe blog Coconut & Lime has a great pictorial step-by-step that might be helpful. What are your personal favorite mango dishes? Feel free to share a recipe or recipe link in the comments section. This is such a familiar story...except I carry back mango acchar (pickled mango) ... my absolutely favorite way to eat mangoes! But believe me its a horror story when its not packed right and all your clothes are covered with oil stains and your bag smells like you brought back the village from punjab. But mangoes in India are incomparable! My favorite there!